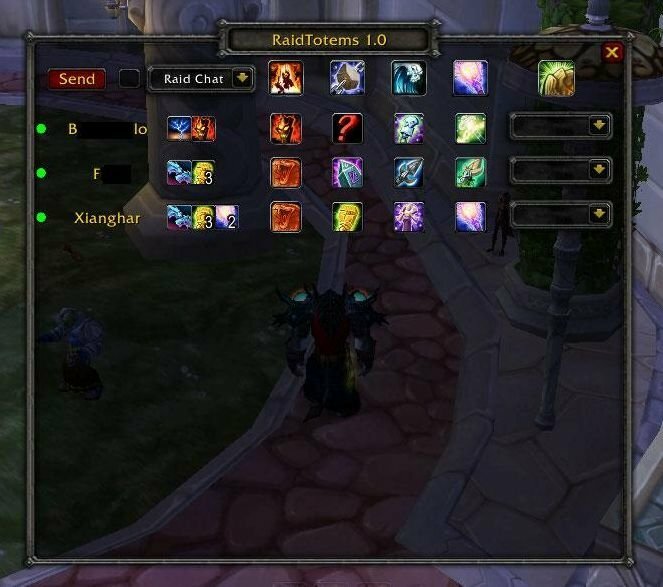 RaidTotems lets one person assign all totems and Earth Shield targets for all shamans in the raid. If a shaman has TotemTimers installed their totem timer buttons will automatically switch to the assigned totems and the Earth Shield timer will switch to its assigned target if configured so. If a shaman does not have TT installed he gets a whisper with his totem configuration and Earth Shield Target. Optionally the totem configuration and Earth Shield targets can be posted to the raid chat or a custom chat channel. If a shaman has TotemTimers installed, RTT shows some information about his talent spec, this information is updated if a shaman switches his spec. If a shaman does not have TT installed it tries to inspect him, but does not update if the shaman switches his spec. RTT then provides a button to reinspect the shaman manually. The totem configuration and Earth Shield target for a shaman is stored permanently and does not change or reset if a shaman or the player leaves the raid or the player relogs. The buttons at the bottom are for managing totem sets. For each shaman his totems and ES target are saved/restored (so for example you can save different sets for specific boss fights). If you update a set with different shamans present in your raid absent shamans are not changed and new shamans are added to it. Please feel free to post comments, bug reports and feature requests. any news on a new release we want to arrange our totems in a raid, ala PallyPower. The next release won't whisper yourself. Forgot to add a check for that since I test it with TotemTimers enabled most of the times. Also you will be able to disable whispers if you send the totem configuration to a chat channel. If you want a button for RTT, the best is probably to put a macro button on your action bar. I usually avoid making minimap buttons since it is already crowded. Similarly you can create a macro button with "/run RaidTotems_SendButton:Click()" as a send button. why do i get the wisper? isent the spam in the chat enough ? TotemTimers has a bug at the moment and does not set the spells assigned by RaidTotems to its timer buttons. Additionally you may get an error when RTT tries to whisper the totem configuration to someone. i tried testing this addon but it didn't seem to work. i had TT 9.1e installed and the latest RaidTotems. I formed a raid with someone and setup RT the totems I wanted assigned to myself. When I pushed "send" i saw the message printed out with the totems i had assigned but TT 9.1e made no adjustments. I was raid leader. Is there something I am doing wrong? are my expectations wrong? 3) while sending totem setup it should change "default" totem for each kind (water, fire, etc) of totems in TotemTimers, so every shaman will have automatically assigned totems to TT, without need of setting it up manually. I've heard this works, but it's not changing my totems in TT (as RL) when i'm sending setup. edit: 5) macro "/rt totems" will also be great idea (/rt totems = /castsequence <RT totem 1>, <RT totem 2>, <RT totem 3>, <RT totem 4>), but in that case you have to add ALL totems to set up, so as a Raid Leader i could assign Searing totem for Enh Shammys in my raid, etc. Last edited by czokalapik : 04-23-09 at 04:13 AM. Error massage by sending the totem setups. 1. Who pops BloodLust first and second. 2. Who is putting Earth Shield on who. If you could tie those in, that would be a dream come true for raiding shaman. Also, I agree that this addon could be a time-saver in 5-mans, too. Thanks again! I have been searching for a mod like this for a long long time. Thank you. Just a few requests. As lame as it sounds it would be nice if it functioned in groups as well as raids. I tend to run with 2+ shamans in a group and it would be handy. Also, it seemed healing stream totem was missing from water. Was this intentional? As I really like the idea this addon has behind it, if I could make a feature suggestion, I use a castsequence macro for my totems and would love to see this addon make a macro for itself and call it something like RaidTotemMacro (RTM for short) and allow me to set up a solo template so that when im soloing it reverts back to my normal macro but in a raid whoever is in charge of the setting up of totems can give me a raid totem assignment and have it automatically switch out my solo macro for the group/raid one. Not sure if I made much sense but if I didnt I will definately be back here to see what people think of the idea. But I am going to check out the addon right now, but from what ive seen and read this looks like a nice addon for the raiding shaman in us all! Last edited by Miralen : 11-24-08 at 07:18 PM.